Join the discussion on our forums! Come discuss Sunreaver Warmage over in our dedicated Sunreaver Warmage discussion topic. Battlecry: If you're holding a spell that costs (5) or more, deal 4 damage. Good with Spirit of the Shark if you have Myra's element or Sprint. Like Crowd Roaster, but easier to trigger (in the sense of more accessible than having to play a dragon package), same health, a bit less damage, but notably cheaper. This card will see lots of play. This is gonna be the next Azure Drake-like deck filler mark my words. Although I do agree that it is immensely strong, Azure Drake fit into any deck with some level of usefulness. 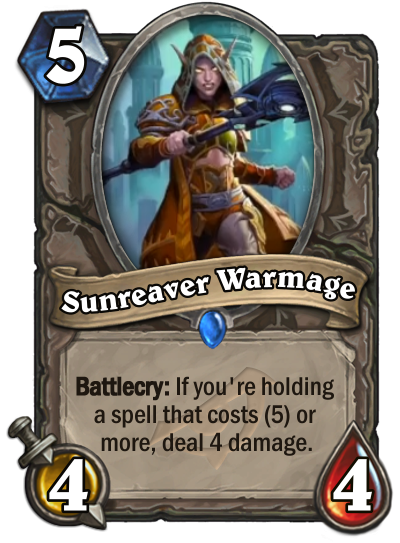 In this case though, plenty of decks go without a single spell that costs 5 mana or more. Indeed it was an auto-include in the early days but it eventually started being like a midrangey/control filler card that not every deck ran but that was still seen a LOT. That's what I'm referring to. And I feel like it's a close comparison given Spell Damage wasn't relevant in the majority of decks that ran it. In control decks I agree. This will be in almost all of them so long as they aren't somehow avoiding large spells. The only value oriented deck I can see possibly passing on this is Rogue decks that run the new Togwaggle since even controlling rogues have few high end spells. Well, big spell any class will like this one. does it have to be big spell though? I think as long you have as least 4 5+ spells in your deck you can run this.